We are blessed to have Vito Gregoli on guitar, mandolin and sitar! Evan Perman will be bringing the sound healing vibes throughout the night blessing us with (his hand made!) didgeredoos, buffalo drum, native flutes, and bowls. Heart Medicine is a singing duo comprised of Annmarie Soul and Karen Seva – blending original songs, mantras and native tribal chants. Together their voices blend in harmonic frequencies creating angelic overtones inviting the listener into a deep musical meditation journey. The music of Heart Medicine is a combination of sacred songs and melodies inspired by nature and spirit, interwoven with healing mantras celebrating many traditions. 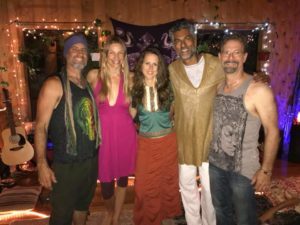 Both celestial and earthly, each song is a gift from the muse of spirit , channeled and lovingly crafted – opening a doorway to the unseen, requesting our presence in a dance with the divine, inviting us into love, and calling our hearts home. is a producer, composer and multi-Instrumentalist who creates genre-defying music that is fresh and expansive. Vito’s early musical roots are in pop, rock, jazz and blues. He was hailed as a guitar virtuoso in his teens and worked regularly around the L.A. club scene. Vito soaked up technique and style, and took a right turn in college with classical music. Vito’s Classical studies naturally led him to scoring film, TV and theatre projects, and eventually he developed his own label, Dharmapala Records. Vito has collaborated with noteworthy artists producing and playing in Pop, Rock and Country genres, as well as specializing in New Age and World Music. Evan Perman is a healing artist and holistic practitioner who integrates energetic healing, bodywork therapy, and spiritual guidance to provide complete high vibrational solutions for his clients. He specializes in Sound Vibrational Therapy using indigenous musical instruments such as his handcrafted didgeridoos, as well as native drums, flutes, shakers, singing bowls and gongs. This a shamanic healing practice – deeply rooted in ancient earth medicine with the indigenous – that has the primal power to transform, rebalance and heal the soul and body through clearing & restoring physical, spiritual and emotional bodies to a natural state of harmony. Evan also offers sound healing meditations and holds sacred ceremony for groups.